The End of the Invacar. One of the most familiar sites on British roads has just vanished. 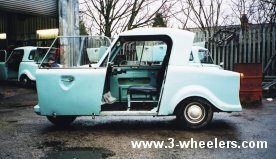 The Invacar has been with us for 55 years but its probably its final form, the blue AC and Thundesley Invacars (pictured), that people are most familiar with. For me my most vivid memory of these vehicles was during the late 1970’s when every Saturday a chap would pull up outside the Fine Fare superstore in Tamworth and sell home grown fruit and vegetables. It sounds daft but I always think of that when ever I see one of these cars. For the last couple of years the British government have been collecting back these cars and sending them to Service Agents who have been crushing around 50 Invacars a month. The vehicles were leased to invalids as part of their disability benefit by the government in a “Invalid Vehicle Scheme” though this ended in April 2003. It was replaced by the DLA (Disabled Living Allowance Mobilty Component) which is an allowance paid to people who are unable or virtually unable to walk. As a result this means that all 3-wheeled Invacars are now illegal to own or drive on British roads and they have been replaced by the 4-wheeled, government approved 340cc Canta. The vehicles are specially adapted for wheelchair use and a large sliding door on either side of the vehicle allows easy access for wheelchair uses allowing the driver to store his/her folded wheelchair at the side of the driving seat. The model pictured featured handlebars with a motorcycle type twist throttle though a conventional steering wheel type was also made. The body of the vehicle itself is made from fibre glass and bolted on to a steel tube chassis. Two engine versions were available with either a 500cc or 600cc Steyr-Puch 4-stroke engine that sat at the back of the vehicle. The vehicle had an automatic clutch (automatic gears) but even so it was said that the 600cc engine was able to propel the Invacar at speeds of up to 82mph. 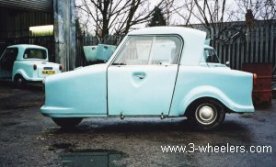 The Invacar finally ended production in 1977 but remained in constant use for a further 26 years. The question is however how many will survive the crushing and still be in existence this time next year? Lets hope that a few of them end up in museums for whilst you may love or hate this little car it is a another great part of British motoring that has come to an end. Photo showing the sliding door to ease wheelchair access. 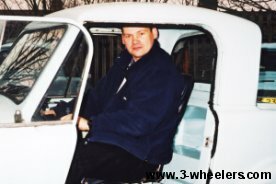 This is me trying out an Invacar for size. Despite being 6ft 3” I fitted in their with ease but don’t think I would like to turn corners in it.